A construction boom in Myanmar is fueling a demand for raw materials like limestone and sand. Extracting these resources threatens ecosystems and communities along the Salween River. This push for economic and industrial development is also driving plans to build megadams on the Salween River. Activists call for an alternative vision for development, based on sustainable technologies and small-scale, decentralized projects. Tun Lin, the 36-year-old security guard who mans the door to the Linno cave – home to four species of bat. Photo by Demelza Stokes. Tun Lin has a unique occupation: he is the security guard at Linno limestone karst cave on the bank of the Salween River in Myanmar’s southeast Karen (Kayin) State. He earns 80,000 Myanmar kyat (around $60) per month to guard the entrance to the cave, the contents of which — common nectar bats (Eonycteris spelaea), wrinkle-lipped bats (Chaerephon plicatus), Theobold’s tomb bats (Taphozous theobaldi), black-bearded tomb bats (Taphozous melanopogon) and a lot of guano — are targeted by robbers who either poach the bats or steal the guano that is sold in the local area for use as fertilizer. Only five months on the job, the 36-year-old has not yet encountered any thieves, but the last time hunters came, they used nets to scoop up over a thousand of the cave-dwelling bats. Captured live and kept in bags, the bats were sold on as food or as traditional medicine, explained Myint Myint Nwe, the cave’s license holder and customary “owner.” But it’s not just the cave bat colonies that are at risk here in Karen State. In fact, the entire limestone karst landscape, and its natural formations and caves are increasingly at risk from Myanmar’s (and Southeast Asia’s) booming construction industry, the bedrock of surging industrial development. This is the final article in a five-part series exploring Myanmar’s Salween landscape amid galvanizing plans to develop hydropower projects along its course. Part II looks at the Salween dams’ already bloody legacy and the projects’ direct or indirect relationship with perpetuating instability and conflict in Myanmar’s Shan and Karen states. Part III uncovers some of the ethnic and ecological biodiversity at stake, focusing on the Kun Heng “thousand islands,” a unique riverine ecology facing submersion under the Mong Ton dam reservoir in Shan State. Part IV introduces the “Salween Peace Park,” combining wildlife conservation and peace-building in Karen State, where the world’s longest running civil war has raged since 1949. Myint Myint Nwe hires security to guard the entrance to Linno cave. At dusk, more than 400,000 bats exit the cave through the large hole above the locked door, their exodus lasting over an hour. Photo by Demelza Stokes. Much of this quarried limestone makes its way to Karen State’s cement industry, which is growing in tandem with burgeoning development in the Salween Basin and throughout Myanmar. Ten years ago, a study in the journal BioScience estimated that companies across Southeast Asia quarry 178 million metric tons of limestone every year — and that limestone extraction was “the primary threat to the survival of karst-associated species, and … will certainly exacerbate the biodiversity crisis in Southeast Asia.” The entire region’s limestone mountains, cliffs and caves — and their residents — are all at risk from quarrying, and Myanmar is no exception. 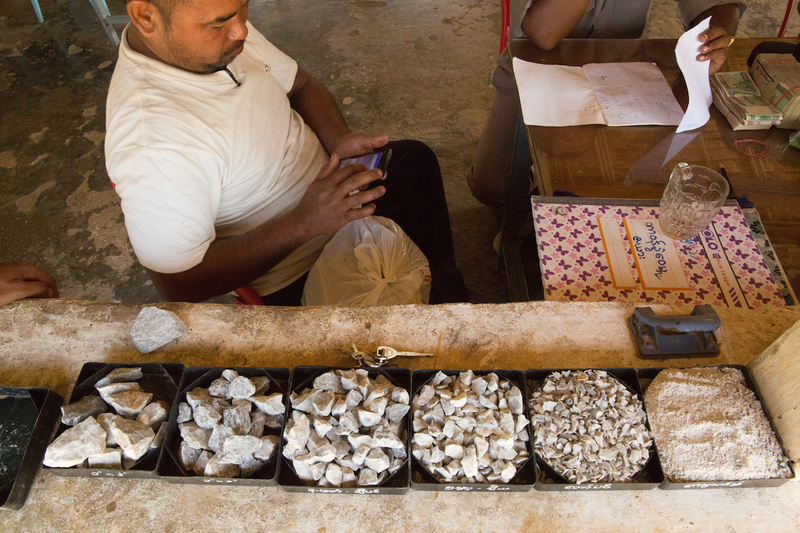 Human Rights Watch reported this year that four large-scale mining licenses for limestone extraction and at least ten exploration permits have been granted in Karen State. The tropical caves that pockmark the sharp rising cliffs are very fragile environments, their unique ecosystems formed by particular combinations of light, moisture and soil. Referred to as “arks of biodiversity,” these caves contain high levels of endemism. Four years ago, a local construction company began blasting rock from the limestone outcrop that surrounds the Linno cave. The impact on the cave’s residents was immediately felt by Myint Myint Nwe, who has held the license to harvest the bats’ guano for twelve years. Once mining began on the western side of the outcrop, the loud disturbance from blasting caused the bats (which number roughly 404,000) to abandon their roosts. She sent a letter to the village chief who then sent the request to the government to stop the mining, “The bats are my livelihood … so I am happy they closed the mine, but they moved to another mountain I think,” she told Mongabay. Limestone at a government mining facility in Myaing Galay, near Hpa-An town, Karen State. According to a 2006 study in the journal Bioscience, less than 1 percent of Myanmar’s limestone karsts are protected. Photo by Demelza Stokes. In addition to producing natural fertilizer, cave-dwelling bats provide other vital ecosystem services such as insect control, seed dispersal and pollination. A 2011 study on the economic importance of bats to agriculture in North America suggested ecosystem services from bats added up to billions of dollars per year. Southeast Asia is home to over 340 bat species, and Myanmar houses almost a third of those, including the Kitti’s hog-nosed bat (Craseonycteris thonglongyai), the world’s smallest mammal (weighing only two grams). At least 40 percent of the region’s bats use caves as roosting sites, primarily due to their large size and stable microclimates, the Southeast Asian Bat Conservation Research Unit has reported. Myanmar’s complex limestone cave systems allow for great diversity of bats, with multiple species often sharing roosting sites. A 2009 study suggested isolated karst outcrops can serve as important population reservoirs for cave-roosting bats, slowing down the decline of bat diversity in fragmented forests. Cave-dwelling bat colonies have traditionally been protected by Myanmar’s local communities and Buddhist monks, but the loss of Karen State’s limestone caves due to mining or other disturbances could lead to a knock-on effect in declining bat populations in surrounding connected areas. Reduced to rubble - a huge pile of limestone lies at the military-owned cement factory in Myaing Galay, near Hpa-An town, Karen State. Photo by Demelza Stokes. The mining of Linno cave to provide raw materials for road construction in this part of Myanmar feeds into the broader transformation of Southeast Asia’s landscapes and the increasing fragmentation of wildlife habitats. WWF reported this year that Asia’s infrastructure development boom will lead to the construction of 11,000 new kilometers of transport projects, increasing the vulnerability of tigers and other wild animals due to “unmitigated fragmentation and destruction of their habitats.” Deforestation around the Salween dam sites and their associated road construction projects is a side-effect of large hydropower projects as their development reverberates into the surrounding ecosystems (see Part 3). Another key ingredient in the cement industry feeding Asia’s industrial development is sand. Aung La Teh, ex-headman of Kaw Ku village keeps an eye out for illegal dredging boats puttering around Kaw Ku Island. He and the other villagers who farm the sediment-rich island in the middle of the Salween are concerned because sand mining — on the island itself, or upstream — causes erosion of the island. “The Border Guard Force and business cronies, they came and took sand from the island,” U Saw Thein Mein Go, Kaw Ku village’s chief told Mongabay. “Last year they destroyed one part of the island. Since myself and another chief went to stop them, we told parliament and we asked them put a stop to it.” The villages that share the use of Kaw Ku Island have an agreement to take sand from the island or the riverbed for their own use, not for sale, but the increasing commercial demand for sand has seen the Salween riverbed become increasingly coveted. Sand mining isn’t the only thing threatening the existence of Kaw Ku Island. If plans to build five large dams on the Salween go ahead, the levels of sediment that drift downstream and build up on the island will be depleted. Most years, the natural hydrological cycle of the river sends seasonal floods in August (at the peak of the monsoon) that cover the entire island. “The levels depend on the rains. When the water floods the villagers are really happy because they get more sediment for their agriculture,” Aung La Teh told Mongabay. Aung La Teh is from one of the two villages that have over the past thirty years shared the use of Kaw Ku Island to grow vegetables. He told Mongabay that his profit from the sale of vegetables depends directly on the quality of the sediment on the island. 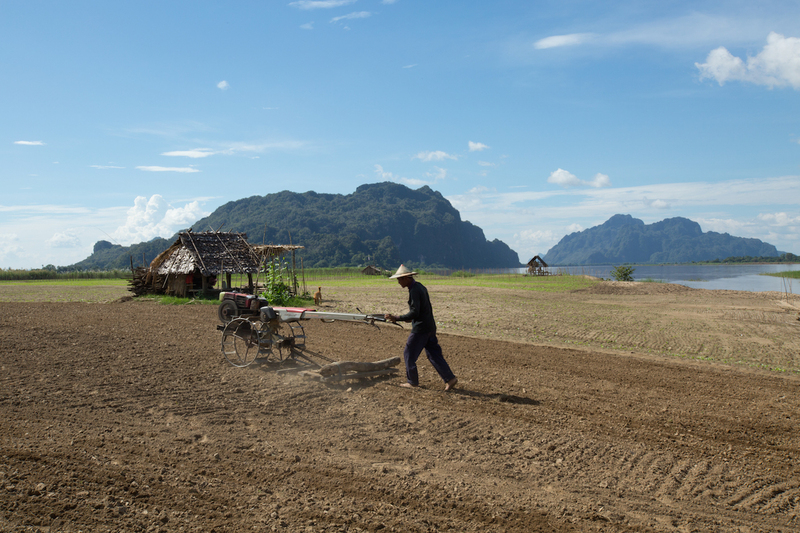 Farmers like ex-headman Aung La Teh depend on sediments from the Salween River to fertilize their crops on Kaw Ku Island. Photo by Demelza Stokes. Aung La Teh and other villagers who cross the Salween each year to farm on Kaw Ku believe that the Hat Gyi dam (and the other four dams) will seriously affect their agricultural production and livelihoods. Aside from depleting the sediment levels on which they depend, plans for the Hat Gyi hydropower dam include a water-diversion project that will siphon water from Hat Gyi’s reservoir across the border to store in the Bhumipol dam in Thailand’s Tak province. Thailand will reportedly use the water to cope with recurring severe drought problems, but critics of Hat Gyi worry excessive water capture and diversion will severely affect the rural communities downstream in Myanmar who depend on agriculture to survive. The Hat Gyi dam site is located in Karen State’s Hlaingbwe township, about fifty kilometers from the Thai border and 100 kilometers from the mouth of the river in Mon State, where it flows into the Bay of Bengal. The 1,360 MW project will be developed by EGAT International Co. Ltd. (a subsidiary of the Thailand’s state-owned Electricity Generating Authority), Myanmar’s energy ministry (MOEP), Myanmar’s International Group of Entrepreneurs Co. (IGE), and Chinese state-owned Sinohydro. If it goes ahead, the Hat Gyi dam will be the first Salween dam to be constructed. According to International Rivers, a second environmental impact assessment has been completed for Hat Gyi, but the full version of the report has not been made available to the public. Lack of transparency around the Salween dams’ impact assessments troubles observers. The best hope for mitigating the ecological and social effects of a project is through comprehensive studies of the dams’ potential social and environmental impacts conducted prior to construction, when it is still possible to influence the decision-making process. “It is urgent that the future of the Thanlwin (Salween) River is responsibly planned and equitably managed to protect the environment and the inhabitants of the watershed.” Maung Maung Aye, Chief Advisor at the Myanmar Environment Institute, told Mongabay. While it can’t save ecosystems, providing compensation for loss of lands or moving people to relocation villages can offer a solution for dam-affected communities. However, even in peaceful conditions these processes repeatedly fall woefully short of their objectives (see Part 3) — let alone in Myanmar’s conflict-ridden borderlands, where people may have already been relocated multiple times due to conflict. 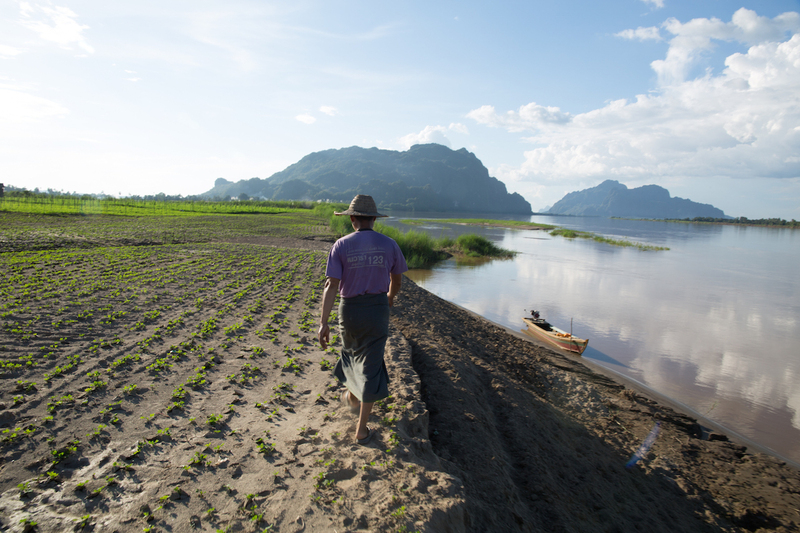 Villages on either side of the Salween river share the use of Kaw Ku Island in the middle of the river to grow seasonal rice and vegetables. Photo by Demelza Stokes. River-dependent communities like Aung La Teh’s, who have for generations depended on the river’s natural monsoonal fluctuations to farm, are in the dark about how the dam and its proposed water diversion project will affect their livelihoods. Six villages depend on the nearby Dawla Lake, which is connected to the Salween near Kaw Ku Island. The lake fills up during the monsoon and fish from the Salween migrate and breed in the lake, and during the dry season, villagers graze their cattle on the land. The villagers who depend on Dawla Lake’s flooding for their fishing and farming needs will be forced to seek out their livelihoods elsewhere if the lake dries up. Scientists have warned that dams on the Mekong could disrupt fisheries and seasonal floods, creating an “ecological time-bomb” that threatens “the food security of millions” — an ominous portent for downstream Salween farmers. Myanmar does need to increase access to electricity to fuel its growth and development. Severely lagging behind its neighbors, it has one of the lowest electricity consumption rates in Asia. However, the construction agreements for the Salween dams, signed while Myanmar was still under military rule, grant most of the electricity to China and Thailand, leaving Myanmar’s rural communities to deal with the environmental and social consequences. People living near Kaw Ku Island want more electricity, but many are adamantly against the construction of large dams on the Salween River. “We cannot accept that by going against the Hat Gyi dam, we cannot get electricity,” a man from Mi Kayin village explained to a researcher working amongst downstream communities earlier this year. Sand mining upstream has caused erosion on Kaw Ku Island. Villagers are also worried that the Hat Gyi dam will decrease the amount of silt and sediment deposited by the river, lowering soil fertility and reducing their agricultural yields. Photo by Demelza Stokes. The villagers are worried that the Hat Gyi dam (and the four other huge Salween dams) will seriously affect their agricultural production and livelihoods. Last week, at a Green Energy Forum in Yangon, 422 civil society groups published a statement calling for more sustainable energy solutions to meet the country’s energy needs. “Myanmar is in a unique position to leapfrog fossil fuels and mega dams to focus on renewable energy, especially community-owned off-grid solutions, which can be much cheaper than expanding the central grid,” it said. 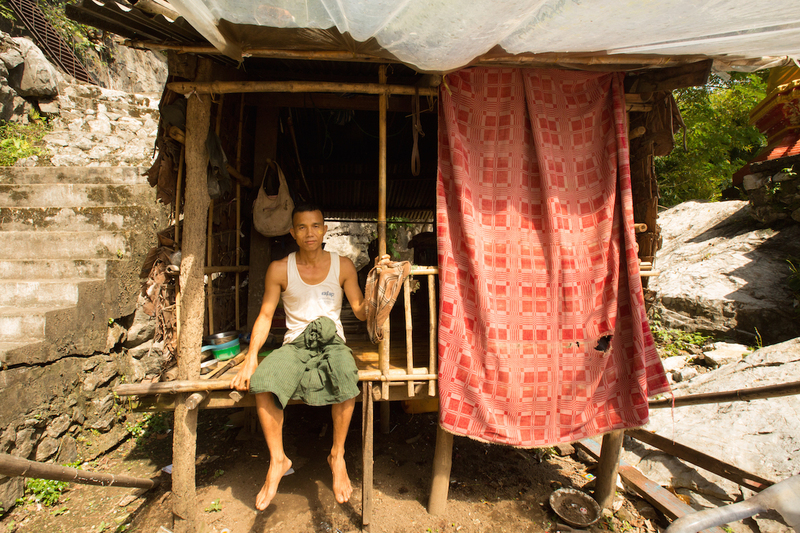 Approximately 70 percent of Myanmar’s citizens live in areas not connected to the national grid, and critics of coal and big hydropower projects are calling for small scale and decentralized energy sources as a more efficient solution to filling Myanmar’s energy gap. “While providing electricity for consumers and industry is a clear priority, the long construction time rules out large dams for solving the immediate crisis,” Jeff Rutherford, a consultant who has studied the Salween basin for over a decade, told Mongabay. The statement released during the Green Energy Forum called on the National League for Democracy (NLD) to honor promises made during the 2015 elections, which delivered the party a majority in the new, civilian-led government. In its 2015 campaign manifesto, the NLD warned “the construction of the large dams required for the production of hydropower causes major environmental harm” and committed to generating electricity from existing dams. In fact, the NLD have Myanmar’s democratic transition to thank for increased pressure from environmental civil society groups, who have up until very recently been muzzled by repressive orders such as the ban on public gatherings of more than five people that was instated in 1988. It was only lifted in January 2013. “We are engaging this freedom not long, it is very recent,” Pyi Pyi Thant, a researcher at the Mekong Energy and Ecology Network told Mongabay. “The political process domestically has allowed for the environmental movement to get stronger, more big,” she added. Myanmar’s environmental movement has had some success in bringing the Salween into the spotlight, out of its historical marginalization in the ethnic minority areas along the country’s eastern borders. Still the longest free-flowing river in Southeast Asia, the Salween remains one of the world’s richest veins of ethnic and biological diversity. It harbors a collection of indigenous cultures and pristine habitats — found nowhere else on earth — and all are at stake in damming the river. Myanmar’s government hopes to exploit the Salween’s energy potential and generate revenue by selling electricity from a cascade of giant dams. They will get some of the electricity, but most will be exported to China and Thailand. If the dams go through as planned, huge reservoirs will be left in place of flowing rivers, massively disrupting the architecture of surrounding ecosystems. They will eradicate forests and farmland, and cause mass displacement of people already stricken by poverty and conflict. They can destroy fisheries. They will increase erosion and dramatically change the levels of silt and sediment downstream, which will lead to increased salinization of its waters near the river mouth. The Salween has multiple futures mapped out. China’s apparent decision to shelve plans to dam the upper section of the Salween (Nu) could wildly change its upstream development pathway — a victory for scientists and environmental groups who have worked to document the river’s biodiversity and make the case for preserving its integrity. Downstream, that same integrity makes the Salween a kind of final frontier for the heavyweight Chinese and Thai dam developers that have built large hydroelectric dams across the region. The multibillion-dollar investment projects will help Myanmar keep pace with the breakneck speed of Asia’s industrial development, but at the cost of thousands of ethnic minority peoples’ livelihoods and of one of Southeast Asia’s most wild and enigmatic landscapes.